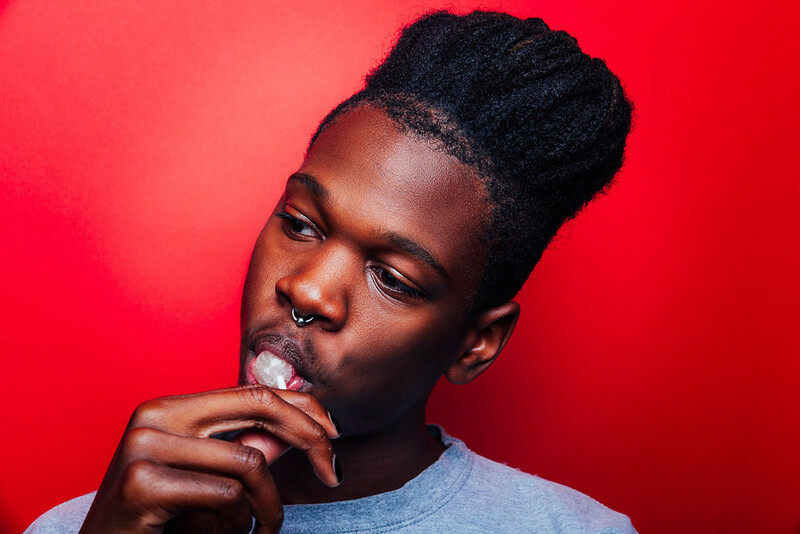 It's been a sharp ascent into the music world for 20 year old Shamir Bailey. If we had spoken to the Las Vegas native 18 months ago, he would just be a regular kid laying low in the suburbs, playing in punk bands, reluctantly thinking about the monotonous job he would have stick at until a good idea finally popped along. I've just awoken Shamir. He's been hiding under a sleeping bag on an oversized sofa at XL headquarters after a long haul flight from America. He rubs his eyes and heaves himself up to greet me with a hug. I can't help but think if that was me I would demand another 10 minute snooze or spew a lengthy string of obscenities at whoever dared wake me. I'm no Sleeping Beauty, put it that way. As we settle down to talk, he wraps himself in the sleeping bag and devours a bowl of Haribo (as do I) whilst we begin to chew over his debut album Ratchet, set for release next month. It's been a sharp ascent into the music world for 20-year-old Shamir Bailey. If we had spoken to the Las Vegas native 18 months ago, he would just be a regular kid laying low in the suburbs, playing in punk bands, reluctantly thinking about the monotonous job he would have stick at until a good idea finally popped along. He was spared that fate thanks to a shot-in-the-dark email to Nick Sylvester's Godmode label. Attached were demos which would form part of his rapturously received debut Northtown EP. On hearing the demo for 'If It Wasn't True', Sylvester paid for Shamir to fly out to New York (it was only his second time on a plane) to start working on music together. After the EP came a deal with XL because that's what happens to Shamir all the time, apparently. He makes it sound so easy I could literally throw up. 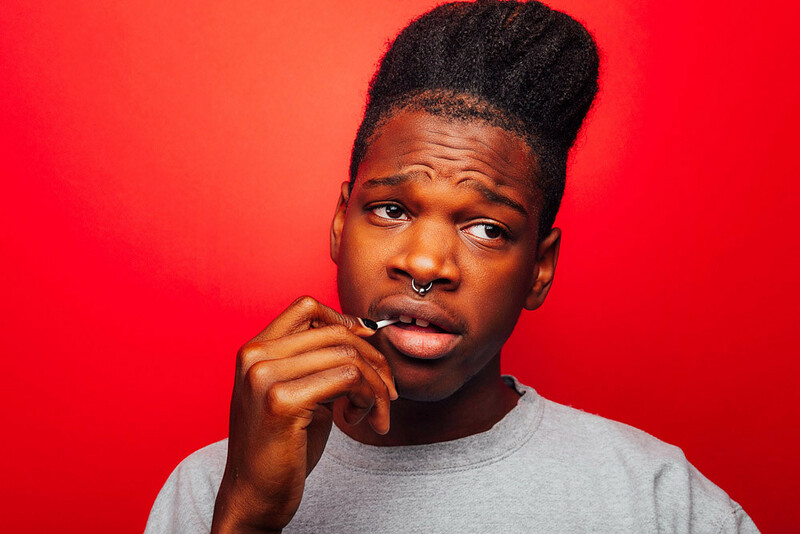 To be fair, Shamir has something that most people don't - a truly distinctive singing voice. Androgynous is term that gets banded about a lot but that doesn't do justice to his raspy, dainty and raw countertenor. It's perfect for bruised and broken ballads but on Ratchet, its primary function is fierce and feisty party bangers. His talking voice is placed at the same high register, which is fairly unusual, but he doesn't shy away from it, rather he's made it his USP. Perhaps he's getting bored with the inevitable ignorant questions about it, as he wrote on Twitter recently, "To those who keep asking, I have no gender, no sexuality, and no fucks to give." I doubt it will be the last time he gets asked about it but that tweet deserves as many nail polish emojis as you can possibly fit on a computer screen. Recorded in a basement in Brooklyn with Sylvester, Ratchet shows growth from the rougher recordings that comprised Northtown. Slick, rubbery bass lines, a cacophony of chaotic synth break downs, lyrical sassiness and earworm melodies are the body that moves this record. It's also chock full of influences from house ballroom, disco, electro-punk and pop. He mentions that he feels more inspired in isolation which seems at odds with Ratchet's jaunty rhythms and exuberant personality. He also lists Alex G, Mac Demarco and Alvvays as his favourites during the recording process, which aren't immediate influences either. It gives me the impression that Ratchet is only one side of Shamir, that we're yet to see the full package. Like a game of pass the parcel, as each layer is revealed, I expect that the fascination and intrigue with Shamir will only escalate. Let's talk about 'On The Regular'. It's gone down really well with people. What I loved about it was that it was so boisterous, full of bravado. Was that an important side of yourself to show? Uhmm. Just to show a different side of me. It was also just a very fun thing. I would never have thought that would be a single! Especially because I'm rapping on it more than anything and before that I'd only been singing. Also I feel like the EP was sadder and introspective so I wanted to show I could be confident, boastful. For me that's what rap music is - very confident - and I grew up around that stuff too so I wanted to show that side of me and I'm glad that everyone is really liking it. Yeah, I don't think I've ever been like really ever been bullied bullied. I think a lot people, y'know, have misunderstood certain things at certain times. I think my way of handling and combating that is to wear that on your sleeve, putting more of yourself out there. I think the more you do that in a confident way, people accept it, they almost admire it. [With the lyrics] I didn't put any thought into it. The song is just filled with Shamirisms. It's almost like me on a good day when I'm feeling good, talkative, and around a lot of people. 'On A Regular' is roughly what a conversation with me is. Seriously. It's very much that side of me all at once which, as a lot of my friends will tell you, that's how I am. I'm not like that all the time obviously but especially when I'm around people, when I'm with my friends, it's just me on the regular (laughs). You had the 'Call It Off' video come out recently, which is awesome, tell me about how that idea came about. I was sent a bunch of ideas for the YouTube Awards thing and that one obviously stood out simply because... muppets, y'know? Honestly I didn't even realise what was going to be happening in the video! I was like, 'There is going to be a muppet version of ME?!?' I was like lets go with this idea, yeah! Sold. How was it all filmed? Well they had like world-renowned puppeteers, people who do this for movies and stuff. At the end in the car scene they were all like crouched down in the car with me while the other muppets popped up and everything. They made up the muppets really fast. I remember them sending me the first sketch and after I approved it they had them done in a week or so. Did you get to keep your muppet? Why? What happened to it? I dunno know. I think they said they are going to frame it or something. ...well we were talking about signing to XL and how they felt it was a good fit for them because they, like everyone on the label, is in their own world. No two artists sound the same. Is that how you see your own music? Do you feel like you are more of an artist or a musician? I'm definitely a musician but I'm also an artist. I feel like I'm more of a musician but only because at this point, music for me is like breathing. It's like second nature, my sixth sense. It's all I can think about but I create art in so many different forms. I like to knit and crochet, cook, I like to screen write and tell stories, stuff like that. I'm definitely an artist in that I don't just have one medium but music is my medium at this point. It's my easiest medium. Knitting is really hard. My nan taught me when I was younger but I didn't keep it up. I made this on the plane [reveals a large turquoise beanie hat]. That's cute! If you got really industrial you could sell them at your show. There is definitely a gap in the market for knitted merch. I want to but I'm trying to think of ways I can put my stamp on it. I guess I wanna get some tags made but I wanna make hand made stuff for my shows too. So obviously you would want to make more music in the future but what else is on your list to do? I'm just really itching to get into film making. I write comedy. I want to get into screen writing and film making, making short films, and I got something coming along the way to you soon. I'm not supposed to talk about it now or whatever but I've worked on a little comedy short. It's very interactive, I'll tell you that... (Editor's Note: we suspect he might be talking about this). 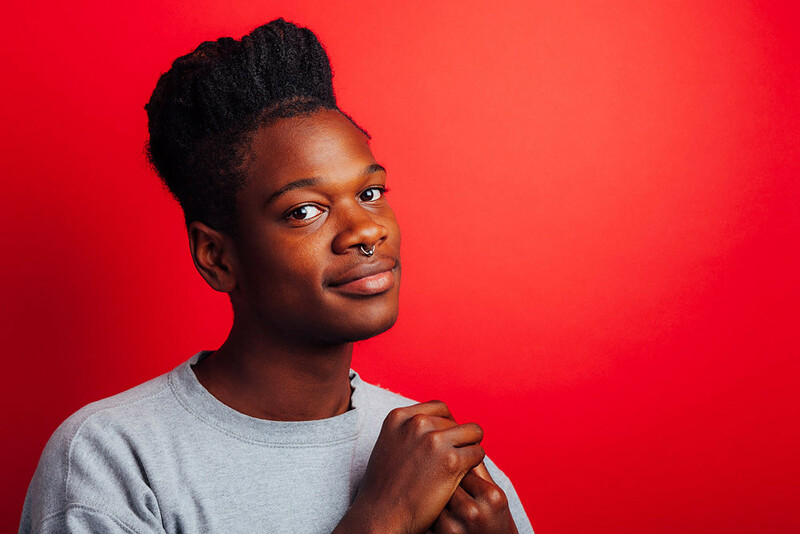 Shamir's forthcoming album, Ratchet, is set to be released on May 18th via XL Recordings. Disclaimer: The images found in this article have been licensed to The 405, but remain the property of the respective photographers. Use of these images without prior arrangement with the photographer is forbidden. For more information, please email the respective photographer or tim@thefourohfive.com.